Making chili in a pressure cooker is a fast way to make a delicious and healthy homemade meal for your family. Since pressure cooking takes less time than traditional stove top cooking, you can have bowl of chili in less than an hour, including prep time. Pressure cooking will also tenderize your meat so you can use a cheaper cut without worry. 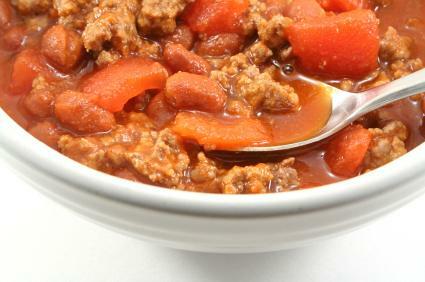 Try this classic recipe for beef chili. Lightly spray the bottom of your pressure cooker with cooking spray. Over medium heat, add the ground beef or beef cubes to the pressure cooker and begin cooking until browned. This should take about 8 to 10 minutes. Remove the beef and drain from fat. Set aside. Add olive oil to the pressure cooker and sauté the onion, bell pepper and jalapeño pepper over medium heat for about 4 minutes or until the onion is translucent. Return the ground beef to the pressure cooker and mix in the beans, diced tomatoes, tomato paste, brown sugar and seasonings. Add the water and mix all ingredients together. Lock the lid of your pressure cooker and bring it up to pressure. Reduce the heat and cook for 10 minutes. Remove the pressure cooker from the heat source and allow the pressure to release. Once the pressure is fully released, remove the lid and stir the chili. You can serve your chili on its own or add a side such as cornbread. If you have leftover chili, you can use it as a topping for hot dogs or nachos. To ensure consistent cooking, cut foods into uniform sized pieces to promote even cooking. You can use more liquid than recommended in a recipe, but never use less. If you end up with too much liquid at the end, you can simply cook the food uncovered in the cooker pot until the liquids are reduced. Never fill your pressure cooker past the halfway point.This can cause the ingredients to boil over and will make a mess. To reduce the chances of burning food, bring the recipe to a rapid boil before closing the lid of the pressure cooker. This will allow for quicker pressurization. Experiment with different recipes. Not every pressure cooker will cook the same way or in the same amount of time. The most important thing to keep in mind before using your pressure cooker is to become familiar with the owner's manual that came with your cooker. It is important to always follow manufacturer's recommendations when using your cooker for not only best food results, but for safety as well. Chili is a great recipe for a pressure cooker. You can make it in very little time and have a warm, relaxing bowl of chili in less time than it would take to order something out. To save on even more time, have all your ingredients cut up the night before. You can even brown your beef ahead of time and add it when you are ready to cook.